Catherine Parr Traill’s The Female Emigrant’s Guide, and Hints on Canadian Housekeeping, published in 1854, provides a fascinating look at the 19th century diet of rural Canadians. In this work, we find recipes for pancakes, jellies, pies, and meats. 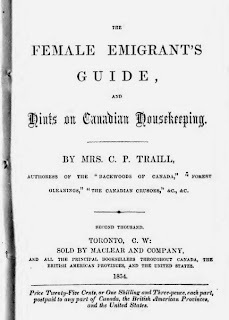 Traill wrote the book for women who were planning to emigrate to Canada in order to advise them as to the conditions that they would find as farmers. As women coming from England often lived in cities with bakers, tailors and other amenities, they often lacked the household skills that were required in order to survive in the backwoods of Canada. Traill explained how to harvest and refine North American plants, with which all emigrants from the British Isles would be equally unfamiliar, from “Indian-corn” to the sap of the maple tree. She also provided a list of what to expect in the months of the year, comparing the typical weather conditions of each month to those with which emigrants from Britain would be familiar. Traill also took for granted that her readers already had prior knowledge to certain culinary techniques, such as how to bake a pie crust, and thus did not provide any guidance on these matters. Heeding Traill’s advice, this month, the members of the Historical Cooking Group have tried to enter the mindset of mid-19th century settlers encountering a mix of foreign and familiar ingredients as we try out her recipes. 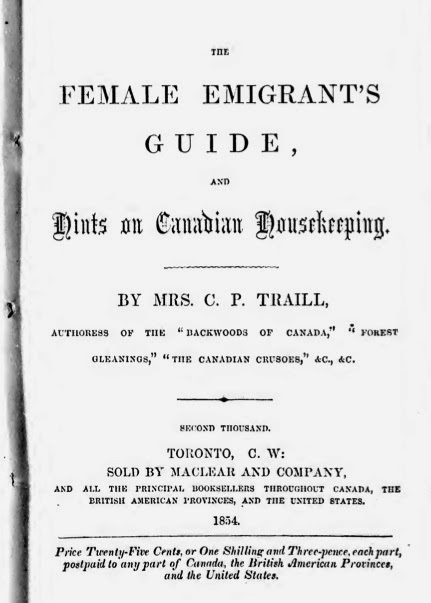 More than providing hints on how to make soap and coffee substitutes, however, The Female Emigrant’s Guide shows that Traill believed that life in Canada would lead to personal development for women. The book was therefore an instrument for the empowerment of the women who emigrated to Canada in the mid-nineteenth century. As we cook through the recipes in 2013 has the meaning of the recipes changed? Does cooking from this 19th century text allow us to better understand and connect with Canadians of the past (an especially difficult question as Traill refers to herself and readers as English throughout her book)? Stay tuned for upcoming posts to see how our group fared with these recipes! On Tuesday Carolynn McNally will explain her adventures with Traills’ pie recipes. Following an old recipe can be challenging. Following a recipe that is not written, but only depicted in pictograms and drawings, archeological examples, and assumptions is even more difficult. The job here is to not only follow the recipe, but also try to understand the culture and traditions where this bread came to be. In this case, I’m trying to make bread as it was done in ancient Egypt. Bread is not only one of the oldest food staples in many cultures, but it is also a good marker of civilization. It’s present in some way or another in many ancient civilizations. Bread not only needed settlements for growing wheat (or an equivalent grain), but also required knowledge of oven making, and, in many cases, an understanding of leavening. Bread helped to properly use the nutrients of the grains, and allowed them to use the stored grains during long winters. It built communities, brought people together, and shaped the routine of those who needed to bake bread every day. At the Historical Cooking Project we have the pleasure of publishing the research from food studies scholars coming from various disciplinary backgrounds. However, the majority of our contributors are historians. Part of the mandate of the Historical Cooking Project is to make information about food studies publicly accessible and available at no cost. Over the past two years we have also begun to publish Behind-the-Scenes pieces in which scholars discuss their methodologies aka how they conduct their research. Many historians rely on archives. Today's post is meant to demystify the archives. So what is an archive? Archives are an accumulation of historical records or the name of the physical place they are located. All of us have our own personal archives. You may keep a diary, make photo albums (physical or digital), keep your tax records, etc. Today's guest post by Jim Chevallier argues that the invention of the restaurant was not "a big deal." Last fall I delivered the manuscript for my book, A History of the Food of Paris. This includes, among other things, a look at the first restaurant and what came before it. Yet it was several months before that I realized: the restaurant was no big deal. This claim will, at the least, surprise anyone familiar with the question. In her excellent Invention of the Restaurant, historian Rebecca Spang upended the established idea that Boulanger founded the first restaurant in 1765. Yet even she implies, by her very title, that the restaurant was an important, even disruptive, innovation.